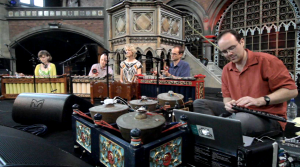 The Augmented Gamelan project was set up to explore the combination of gamelan and electroacoustic music, with a focus on the way the instruments are traditionally played. The sound of this percussion ensemble from Indonesia is broken down, extended and warped through custom software and speakers placed amongst – and sometimes attached to – the instruments. The repertoire is based on traditional material and may be played in a wide range configurations to adapt to the space and context of performance. Many pieces also use traditional vocals including macapat (Javanese sung poetry). “Augmented gamelan” was initially a temporary umbrella term to cover some of my research activity, but it’s stuck over the years. The Augmented Gamelan performing group currently consists of members of the Southbank Gamelan players in various configurations (from left to right, above): Charlotte Pugh, Malcolm Milner, Cathy Eastburn, Robert Campion, and Charles Matthews. For the current set we use a selection of instruments from various ensembles, found objects picked up at antique markets in Indonesia, and electronics. I’ve also been working on solo performances as Charles Matthews, sometimes crossing over with my dance music-oriented project, Ardisson. This site features a piece of software called Pipilan developed in Max/MSP for the creation of music involving gamelan and electronics. Pipilan has been used for performances with the Augmented Gamelan ensemble as well as in collaborations with electronic musician Serocell. It is currently available for free download (Mac only).